Dramatic Celtic styling spotlights your family history, as the authentic coat-of-arms for your family surname is painted by hand in vibrant enamels and inks. 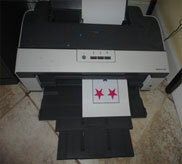 This parchment features custom matting (choose from Green or Blue below) and framing with an alder wood finish, creating a classic look that readily complements your home or office décor. A dominant warrior force throughout Europe, the Celts are also renowned for their spectacular artwork, a distinctive style that highlights detailed Celtic knots, crosses, and mythical animals. Today, some of the most celebrated artwork can be viewed in the legendary Book of Kells, a 9th century masterpiece created by Irish monks. 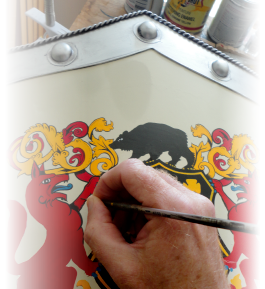 Our exclusive parchment features a shield bordered by a protective Celtic Hound [known as a Catach], with the family surname hand-painted on the outside, while the coat-of-arms and crest are hand-painted within. 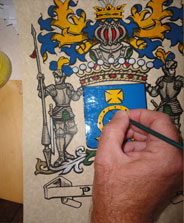 Simply provide the family surname at check out (and country of origin, if known), and your family coat-of-arms will be carefully researched, then hand-painted by a master artist with durable oil-based enamels for vibrant color and lasting finish.